I have blogged several times before about Parted Magic the open source live distribution that can do pretty much anything(test, backup, partition) when dealing with drives. This time I will focus on a specific tool found on Parted Magic meant to provide a method for the secure wipe or deletion of data from a hard drive by overwriting with generated data. Erase Disk is simple to use tool thanks to its easy to understand interface, you can choose the method with which the data will be erased. Keep in mind that we are overwriting the drive, any attempt to recover data after an accidental overwrite will not be possible. 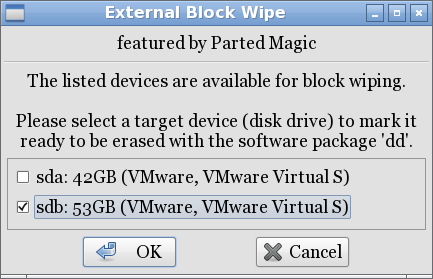 Thanks to Parted Magic you now have an operating system independent tool for erasing disks. Its recommended you disconnect all drives except the one you wish to overwrite. First download Parted Magic from the Parted Magic website and burn the ISO to a CD/DVD or create a bootable USB flash drive. Remember to set the BIOS to boot from removable media, may vary depending on the BIOS, and boot in to Parted Magic. Once you are presented with the Parted Magic desktop go to the left bottom corner of the screen and click on the Parted Magic icon. 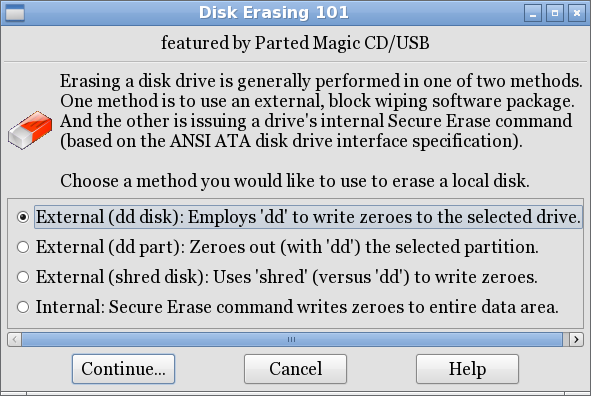 External (dd disk): Employs ‘dd’ to write zeroes to the selected drive. 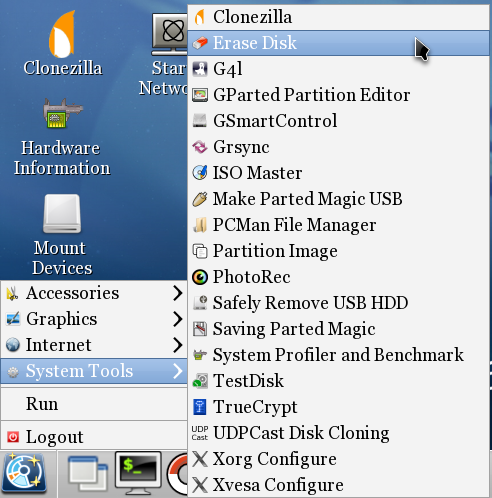 External (dd part): Zeroes out (with ‘dd’) the selected partition. External (shred disk): Uses ‘shred’ (versus ‘dd’) to write zeroes. Internal: Secure Erase command writes zeroes to entire data area. The first option should be enough to completely overwrite the drive. Choose the option you are comfortable with and click on Continue…. Remember to choose the correct drive, otherwise you will not be able to recover the data from an accidental wipe. Click on OK to confirm and start the process. You can actually see the command used to erase the data dc3dd log=/tmp/dd_log.sdb status=noxfer sizeprobe=on of=/dev/sdb bs=4096 count=104857600. Success, remember that it may take a considerable amount of time anywhere from minutes to hours depending on the size of the drive and data. Overwriting a drive will not cost you anything since the tools needed are available free of cost. Formating a drive will only leave you vulnerable to recovery software. Thanks i have it running just now on a 640GB WD hard drive, and browsing with chromium in Parted magic. How long will it take to erase a 40Gb disk(method first option) ? Around 20 minutes, depending on the hardware. I chose the INTERNAL Option to Secure Erase a Solid State Drive. How Do I know, that the drive is actually being cleared? I can only see the pop up window with the message: Secure Erase command has been executed against the selected drive… I do not see any reaction – e.g. : LED of the drive. Do I have to wait from 30 to 180 minutes to see any results? I have used the internal secure erase function on my SSD and found that there was a performance difference afterwards. This is an indirect way of determining if the secure erase was successful or not. Before I erased the drive the results I got from HDTunePro (benchmark test) were not consistant. Afterwards the results were a lot more consistant and the graph smoother. This may not be the case for all SSD drives though.